2. He passed the earlier part of his life in the labors of virtue, whence he preserved purity in both body and soul. This he told me plainly, informing me that his body had remained chaste, just as it had left his mother's womb, and this although he had taken part in many festivals of martyrs when young,2 and captivated the crowds with the beauty of his voice - for he continued for a long time to be a chanter, and was radiant in bloom of body. Nevertheless, neither his bodily beauty nor his brilliance of voice nor his mixing with the multitude injured his beauty of soul, but living like recluses he looked after his own soul, and then increased his virtue through the labors of reclusion. 3. I often enjoyed his company: he would tell me to unblock the door, embrace me as I entered and make extended discourses on philosophy. He was remarkable too for his simplicity, and utterly abhorred subtlety of character; and he loved poverty more than the greatest wealth. During a life of ninety years he wore clothing made of goat's hair; bread and a little salt supplied his need for food. 4. Having desired for a long time to witness a celebration of the spiritual and secret sacrifice, he asked for the offering of the divine gift to be made there. I consented gladly. Bidding the divine vessels be brought - the place was not distant - and using the hands of deacons as an altar, I offered the divine and saving sacrifice. He was filled with every spiritual joy and thought he was seeing heaven, and said that he had never experienced such delight. I myself, whom he loved so warmly, thought I would be wronging him if I did not eulogize him even after death, and that I would be wronging others if I did not put forward this excellent philosophy for imitation. And now, after begging to receive help from him, I shall bring this account to an end. 1. 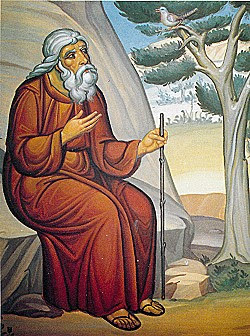 Maris, again of the region of Cyrus (Cyrrhus), became an ascetic in his youth, and lived on for around seventy years, the last thirty-seven of which were spent in strict reclusion. Theodoret knew him personally. 2. At festivals of the saints 'the greatest cleavage of all in late-antique urban society was bridged: for a delightful and perilous moment, the compartments segregating the sexes in public broke down' P. Brown, The Cult of the Saints, 43. Annual concourse round the graves of martyrs can be traced back to the second century, and became of major social importance in the fourth and fifth centuries, replacing the old pagan festivals. 3. The unusual mode of celebrating the eucharist described here was the subject of later canonical legislation in Syria; see Canivet, Le monacbisme syrien, 232.